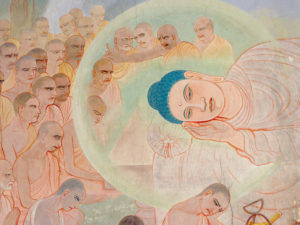 Parinirvana Day is a traditional festival on which Buddhists come together to commemorate the profoundly mysterious occasion of the Buddha’s passing away. It is also a day for reflecting on impermanence and the death of loved ones. Join us for a retreat-like day of meditation, reflection, chanting and ritual. Please bring vegan lunch to share. It will be a quiet morning of meditation, readings and reflection interspersed with mantra chanting. Bodhilila will give a short talk after lunch followed by an opportunity to remember Bhante. There will be a metta meditation where people can ask for the names of recently deceased to be read out and people are also invited to bring pictures of loved ones who have died to put on the shrine. Full programme below.